Real Neat Blog Award, congratulations, 16 awardees! Late in 2014, I made this Real Neat Blog Award. There are so many bloggers whose blogs deserve more attention. So, I wanted to try to do something about that. It is the first award that I ever made. I did some computer graphics years ago, before I started blogging; but my computer drawing had become rusty. So, I made the award with this logo then. It is good to see that this award, which later came back to me, since then has gone to many places of the blogosphere. And that some people have made new logos for it; like the one at the top of this blog post. Nominate any number of people linking to their blogs and let them know you nominated them by commenting on their blogs. 1. Who is your favourite visual artist? 2. Which is your favourite bird species? 3. Which is your favourite mammal species? 6. Where do most visits to your blog come from? 7. If you would be invited to make a space journey, then to which solar system planet would you like to go? Real Neat Blog Award, thank you Charlotte! My dear blogging friend Charlotte of The Inspired Page blog has been so kind so nominate Dear Kitty. 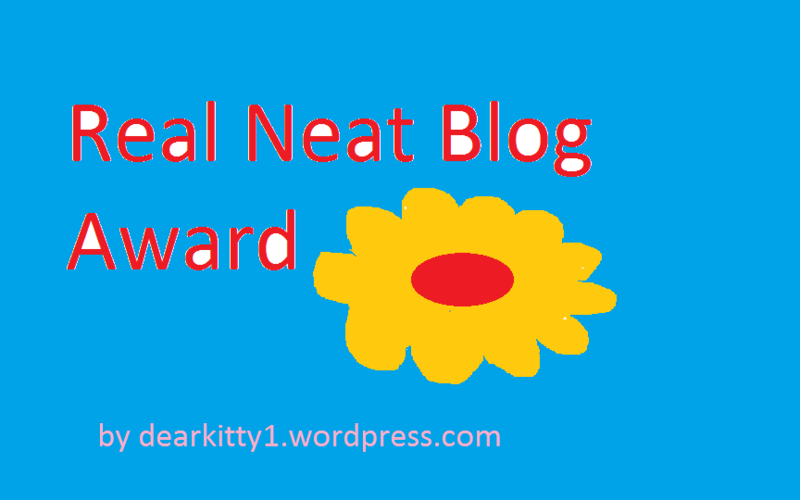 Some blog for the Real Neat Blog Award. It is good to see that this award, now coming back to me, since then has gone to many places of the blogosphere. And that some people have made new logos for it; like the one at the top of this blog post. 1. If you had 50000,000000 million dollars, would you keep it for yourself, or give every cent away? I would keep only a small part for myself. I would spend nearly all of it to found an internet site/TV station/newspaper or maybe all of them: to give good information on science, animals, human rights, peace and more. To counter the war propaganda, global warming denialism, etc. of the governments, corporations and the corporate establishment media. It is sad to see that people who have that kind of money, like Jeff Bezos of Amazon, use it to still get richer and richer, while treating their workers terribly. 2. If you had a superpower, would you stay safe and hide in your house? Or protect other people? Protect other people. However, I never went to acting school. And superpowers basically only exist in films. So, I would not get a role in a film about superpowers. 3. Do you like taking pictures or writing stories? Writing, though I like photos. 4. Sweet or Savory? Why? Savory, as it is better for teeth. 5. Do you like Math or History? Why? Probably history. As the tag History on my blog has more blog posts than my category Mathematics. 6. Do you like cats or dogs? Why? 7. Would you rather have a good education or a good job? Maybe a good job, as working usually lasts longer in a person´s life than education. However, if the question is stopping a good education to get a good job, then I am not so sure. As good jobs may disappear because of austerity. 3. What has been a special moment for you so far in 2019? 5. What is/was your favourite class when still at school? 7. Which politician would you never vote for, supposing you could vote for him or her? Real Neat Blog Award, congratulations, my sixteen nominees!